This Trigger is the first 150cc bike in India to be equipped with Combi-Braking System, which applies both the front and rear brakes when only the rear brake lever is depressed. Standard features include front and rear disc brakes, fully digital speedo console, monoshock rear suspension, and LED taillights. The 2016 Honda CB Trigger delivers an average mileage of 60 kmpl (manufacturer claimed). It is priced at Rs.68,667(ex-showroom, Delhi), and is available in Black, Meteor Green Metallic, and Pearl Siena Red colours. The Honda CB Trigger is targeted at a younger generation of buyers, and hence incorporates trendy styling elements in its design. The bike offers the rider an upright riding position which minimises stress applied on the lower back and wrists, thereby improving comfort while riding for extended durations. The CB Trigger is equipped with telescopic front forks and a mono-shock at the rear. The mono-shock reduces overall weight, whilst offering the same comfort as twin shock-absorbers. The CB Trigger is powered by a 149cc engine that produces 14 bhp @ 8500 rpm and 12.5 Nm of torque @ 6500 rpm, and is mated to a 5-speed gearbox. The long seat and edgy rear cowl look great with its up-swept muffler. It comes with all new two layered LED tail light which looks futuristic and sits on the top of its elongated rear fender which carries the number plate and side indicators. The bike also features new fatty rear tyre and full chain case. The bike is certainly a performer, the ride and handling are also great and despite new changes, the bike looks as stylish as its competitors. The CB Trigger employs a 240mm disc brake at the front and an optional 220mm disc brake at the rear. Also provided as an option is the Combi-Brake System (CBS), where both brakes are actuated even if only the rear brake is applied. Using both brakes simultaneously shortens the distance required to come to a halt considerably when compared to using either brake individually. This is a very useful system as most Indian riders tend to use the rear brake more than the front, and Honda claims that the system decreases stopping distances by up to 32%. Technically, this bike is similar to the existing CB Dazzler. It’s also powered by the same air-cooled, a single cylinder 150cc engine with a maximum power output of 13.81 bhp at 8500 rpm. This 4-stroke engine produces peak torque of 12.5 Nm which arrives at 6500 rpm. This engine is mated to a five-speed manual gearbox with one gear down and four gears up-shift pattern. 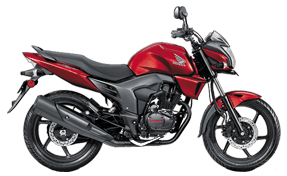 The Honda CB Trigger is meant for those whose commute exceeds 50 km a day and includes occasional highway riding. Insurance is something that you must look for while opting for a bike. It not only protects you from any unwanted mishaps but also mandatory to have in India. With the useful bike insurance cover, you would be able to drive legally. If you are facing any problem in buying the best bike insurance plan, then you must take help of an online insurance web aggregator which offers free insurance quotes to compare.